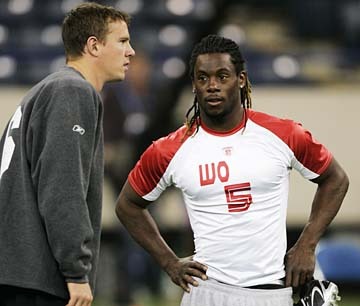 Former Hawaii receiver Davone Bess, right, talked with former Boston College quarterback Matt Ryan at the combine yesterday. Colt Brennan flew home to Southern California last night from Indianapolis with a sense of accomplishment. The former Hawaii quarterback did what he went to the NFL Combine to do. And if not for a dropped pass, his passing drill would've been perfect. Brennan completed 20 of 21 passes at the combine yesterday. Earlier in the week, he weighed in at 207 pounds after being a too-light 186 pounds at the Senior Bowl in January. "I think I answered a lot of questions this week. I came here with two things to do," he said in a phone interview while getting on the plane home to California. "Weigh in heavy and throw the ball well. I did both." Brennan did not run the 40 or participate in agility drills. He said he will do so at UH's Pro Day on April 1 in Carson, Calif.
Two veteran NFL scouts who were present told the Star-Bulletin yesterday that Brennan helped himself with the most impressive display of passing accuracy at this year's combine. "It was very good. By far the most accurate. He showed very good timing," said one scout, who has worked at more than 10 NFL combines. "It was one of the best performances I've seen in that. You could tell he'd thrown a million passes in college. Chad Henne (of Michigan) has a stronger arm, but some of his throws are wild." Brennan said he was relaxed. "I knew I just had to show up and throw. It seemed easier than what I trained for," he said. "It was fun. I had (receiver teammates) Ryan (Grice-Mullins) and Davone (Bess) in my group, so there was good chemistry." Brennan said just one pass each went to his former slotbacks. "That's just the way it worked out. It felt natural and I didn't have any nervousness," he said. He said he threw several deep outs and two long passes. "I was happy I got to throw those out routes, those were important for me," he said. "The first over-the-top was well thrown and the second was just where I wanted it." Said the scout quoted above: "The people who doubted his arm strength probably don't now." Another scout said he would be surprised if any of the four former UH players at the combine -- Brennan, Bess, Grice-Mullins and receiver Jason Rivers -- were not drafted in April. "If I was a betting man I would say yes. I say they all get drafted," the scout said. "Ryan helped himself the most. He worked out pretty dang good. Colt helped himself from the Senior Bowl." Grice-Mullins was timed between 4.48 and 4.59 in the 40, Rivers between 4.51 and 4.70. The ranges on Bess went from "mid 4.6" to 4.80, the scouts said. Grice-Mullins did 17 reps of 225 pounds on the bench press, while Bess did 12. Rivers did not participate. "They all caught the ball pretty well," the second scout said. Linebacker Jordon Dizon (Waimea High, Colorado) was at the combine, but did not work out. He will do so at the Buffs' Pro Day. Kamehameha graduate Kolo Kapanui of West Texas A&M was among 19 tight ends at the combine. He had the sixth-best performance at his position in the bench press, lifting 225 pounds 23 times.